If you’ve ever thought about playing online casino games but have been sitting on the fence, we’ve got five big reasons that could sway your decision. Keep reading to see the top reasons why Silver Oak Casino should be on your list of casinos to have fun at. It’s June, and unless you live in the North Pole, chances are it’s getting pretty hot outside. In some cases, it might be too hot to have fun outdoors (I’m looking at you extreme heat alert). Sometimes it’s better to just stay inside and find a little indoor fun. Silver Oak Casino fits the bill on a hot summer’s day with the type of thrills you want, without forcing you to sweat. Think Silver Oak Casino is built for high rollers? You’re right. It totally is. But it’s also built for newbies. That means if you have $0 to your name, we’d still love to have you. You can create a free account and enjoy play-money tables and slots without having to make a single deposit. Try doing that at a live casino and you’ll be asked to leave the premises. When you do decide to play for real money, Silver Oak Casino will actually hand you free bonus cash to play with. Just sign up and use a bonus code when depositing to score free bonus money. You’ll even earn a free chip that gets bigger and bigger based on how many players use the same bonus code. 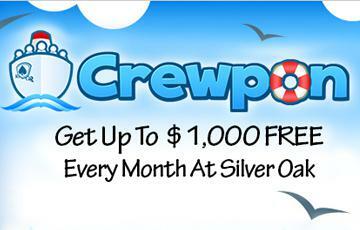 It’s called Crewpon and it’s the best thing to hit online casinos since the AutoPlay button. You know how land-based casino VIP programs treat you to all kinds of good stuff like free merchandise, show tickets, steak dinners, and even hotel rooms? No? That’s probably because you haven’t reached a high enough tier in their loyalty program to receive anything good. Land-based casinos are notorious for advertising their great loyalty program only to hand out the real rewards to the guys who bet $500 per hand at the Blackjack tables. At Silver Oak, we keep track of every bet you make and add things up along the way. You’ll be surprised how fast the loyalty points add up and how soon you’ll earn really incredible rewards. The days of being tied to your PC or Mac to play at Silver Oak Casino are over. Now, you can log in from your iPhone, Android, or whatever tablet or smartphone you’re rocking. Being able to play whenever you want, wherever you want is absolutely priceless, especially when you’ve got the itch to play while you’re out. Those are just five reasons to play at Silver Oak Casino. Download the free casino software now and discover dozens of other reasons for yourself.